Overnight, nine rockets were fired from Gaza into southern Israel. It followed the firing of two rockets towards Tel Aviv, the first time since 2014 that Israel’s second largest city has been targeted. Hamas is being held responsible and there are reports that the missiles used were the Iranian-made Fajr-5. 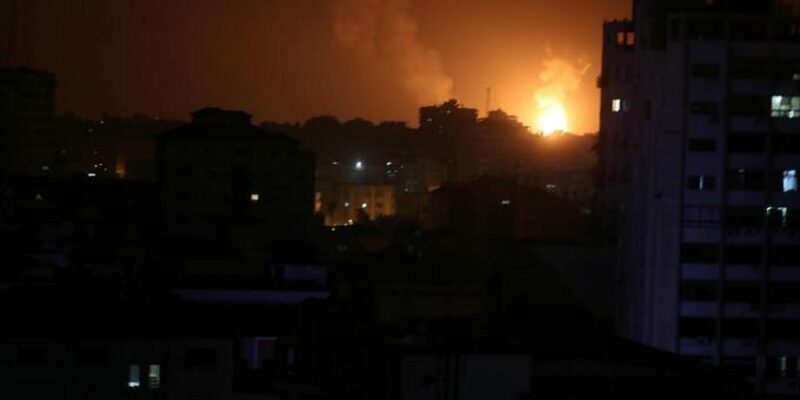 Israel responded overnight by striking 100 Hamas targets in the Gaza Strip (pictured), meanwhile sirens continued this morning in parts of Israel with thousands of Israeli civilians near the border receiving only 15 seconds to take cover. Several hours before the strikes on Israel, the terror group Hamas opened fire on hundreds of Palestinian civilians protesting economic conditions in Gaza. You will not see this in the news, or hear it condemned at the UN. However, next week Israel will be subject to SEVEN biased reports and FIVE anti-Israel resolutions. Israel is the ONLY country to be singled out with its own agenda item and no other country – not even some of the worst human rights abusers – are expected to be condemned. Hamas has NEVER been condemned at the UN. It is time Britain made a stand against this unacceptable discrimination and injustice. In June last year, Britain warned the United Nations Human Rights Council (UNHRC) that the UK will vote against ALL anti-Israel resolutions unless it stopped its anti-Israel bias by the end of 2018. Six months is up, however the UNHRC has not changed. With the Council meeting next week, Britain MUST keep its promise. CUFI is calling upon supporters to write to the Foreign Secretary, Jeremy Hunt, calling for the UK to demand that the UNHRC ends its bias against Israel, call for the end of the anti-Israel agenda item, and if necessary, take further action. Instead of condemning Israel, the UNHRC should be condemning Hamas for the barrage of attacks on Israeli citizens and treatment of the Palestinian people.